Ahead of this week's deadline for insurers to file 2018 HealthCare.gov rates, dozens of U.S. counties lack health insurance options. Insurers must say on Wednesday whether they plan to sell coverage on the Affordable Care Act's insurance exchanges next year. The deadline is the first look at the state of the federal marketplace for 2018: how much rates could go up and which counties are at risk of having no insurers. To date, there are 44 U.S. counties in danger of having no insurers selling coverage on the ACA marketplaces next year, according to the Kaiser Family Foundation. In those counties, 31,268 people are enrolled in coverage; almost all of those counties are Missouri or Ohio. If insurers don't step in to sell plans in those "bare" counties, consumers won't have access to marketplace plans or federal subsidies that make buying coverage more affordable for low-income Americans. Since the exchanges took effect, there has never been a marketplace without an insurer offering coverage, so there's no clear fix if that situation arises. "If there were any other options, nobody told us about it," Kevin Counihan, former CEO of HealthCare.gov, told Modern Healthcare in April. The rates filed Wednesday will likely change as regulators review them. Final information on premiums and insurer participation likely won't emerge until close to open enrollment, which begins Nov. 1, said Cynthia Cox, an associate director at the Kaiser Family Foundation. She added that while some states will release information to the public immediately, others could take weeks. Insurers have already filed initial rate requests in several states and are asking for consistently high rate hikes, in some cases exceeding 50%. 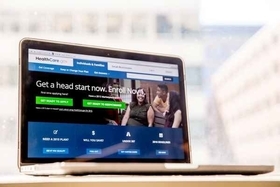 Insurance companies have warned they will raise their rates even further if the federal government doesn't commit to funding cost-sharing reduction subsidies and enforcing the mandate that requires most people to enroll in coverage. California's state-run marketplace, for instance, required insurers to submit two sets of rates—one that assumes funding for the cost-sharing subsidies and one that does not. If the Trump administration doesn't agree to fund the subsidies by mid-August, Covered California will go with the worse-case-scenario rates. A few health insurers have already stepped up to fill the coverage gaps in their states. Small Midwest health insurer Medica announced Monday that it would sell marketplace plans statewide in Iowa next year. Iowa was at risk of having no insurers after Aetna and Wellmark Blue Cross and Blue Shield said they would exit the exchanges in 2018. Gundersen Health Plan, another small plan that sells coverage in just five Iowa counties, has not yet said if it will sell plans in 2018. Medica will also be the single insurer on Nebraska's health exchange after Aetna bailed. "When you find yourself as the only ones between people getting access to care and people not getting access to care, your view of the situation becomes very different," Geoff Bartsh, Medica vice president of individual and family business, said in a statement late Monday. Medica asked to raise rates by 43.5% on average in Iowa. In Washington state, Premera Blue Cross raised its hand to sell coverage in one of the state's two bare counties, Grays Harbor; Klickitat County is still at risk of having no marketplace options.